In the weeks preceding the start of the 1993-94 season, along with the anticipation that accompanies the start of each new campaign, the NBA was hit with as big a shockwave as one could envision. On October 6, 1993, on the heels of his third straight championship and at the peak of otherworldly powers, citing waning motivation stemming from a lack of fresh challenges (I don’t know what actually happened, but doesn’t this sound crazier the further we get from it? ), Michael Jordan, announced his retirement. This marked the second time in 23 months (the first being Magic Johnson’s November 1991 retirement due to HIV) that one of the NBA history’s most transcendent players had unexpectedly called it quits on the eve of a new season. With the possible exception of the late 1970s, at no other point in its almost 50-year history had the NBA been in more dire need of young superstars. It was against this backdrop that the members of the Class of ’93, now flush with NBA cash, tipped off their respective careers. Hardaway, meanwhile, joined the Orlando Magic as the perfect complement to the perimeter duo of Nick Anderson and Dennis Scott, the pick-and-roll prowess of Horace Grant and the force of nature that was a young Shaquille O’Neal. 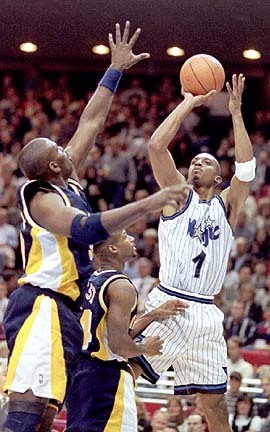 Though he began his NBA career as a two/combo guard (Scott Skiles started for the first half of the season, before being replaced by Dennis Scott), Penny toyed with a triple-double twice in his first seven games, putting up 12- 8- 8 in his pro debut (a blowout win in Miami) and 12- 9- 9 (only fair to mention the six fouls as well) in a six-point loss in Detroit 12 days later. Statistically, both enjoyed fantastic seasons. Webber, the eventual Rookie of the Year, averaged 17.5 points (second among rookies), 9.1 rebounds (4 offensive! ), 2.2 blocks (ninth in the league) and 3.6 assists, with a 21.7 PER. His 55.2% Field Goal Percentage was fourth in the league, while his 305 offensive rebounds (8th) and 13.8% Offensive Rebound Rate (6th) ranked in the top ten as well. He scored in double figures 70 times in 76 games and grabbed 12+ rebounds 21 times, six times while scoring 25+ points as well. In the meantime, not only was Penny building an outstanding RoY case of his own, he was joining the company of the game’s greatest all-around players. He played in all 82 regular season games, logging the tenth most minutes in the NBA, averaging 16 points, 5.4 rebounds and 6.6 assists per game- only Oscar Robertson and Magic Johnson had equaled those averages as rookies- Steve Francis and Chris Paul have done it since- while making 46.6% of his shots. Additionally, he averaged 2.3 steals per game, good for sixth in the league. Nine times he had at least eight rebounds and eight assists in a game- only Scottie Pippen (14) and David Robinson (10) had more such games (Mookie Blaylock and Rod Strickland also had nine). The rest of the 1993 draft’s top five combined for two games of 10+ assists (both by Webber)- Penny had nine. Five times he grabbed 10+ rebounds, equaling the combined number of such games by Jamal Mashburn and Isaiah Rider. While landing on the 1993 lottery’s deepest and most talented rosters certainly didn’t hurt, Webber and Hardaway were major catalysts as their teams cleared the 50-win hurdle and booked spots in the playoffs- in the case of the Magic, doing each for the first time in franchise history. The Warriors, who’d posted a 34-48 record in 1992-93, added Webber to a Nellyball core that already featured Tim Hardaway, Chris Mullin and Latrell Sprewell and improved by an awesome 16 games. Orlando, on the heels of a 20-win improvement (from 21 to 41) in Shaq’s rookie season, added another nine victories to their total. The Warriors’ 50 wins were good enough for the sixth seed in the West and a date with the defending conference champion Phoenix Suns, while the same total was enough to not only break the Magic into the postseason, but to secure home court in the first round against Indiana. Sadly, the two teams only took the floor a combined six times that postseason, failing to notch a single victory. Webber more or less replicated his regular season production (15.7- 8.7- 9, plus 3 blocks and 55% FG), but was no match for Charles Barkley (the Warriors as a team were no better, yielding 123 points per game), who made more than 60% of his shots en route to 37.3 points and 13.7 rebounds per game, including a 56-point evisceration in Game 3- with 27 (on a ridiculous 11-11 FG) in the first quarter- to eliminate the Dubs. As for Penny, he managed an impressive-on-the-surface 18.7- 6.7- 7, but his turnovers (6.7 per game), a foul-plagued Shaq that failed to average 21 per game and almost 30 points per game from Reggie Miller conspired to do the Magic in. Thing is, inauspicious as these playoff debuts were, they provided invaluable experience for Hardaway and Webber, who’d seemingly punched their one-way tickets to superstardom. Meanwhile, at the other end of the standings, under a shroud of anonymity available only to members of sub-25-win teams in the pre-League Pass era, the remaining headliners from class of ’93 were also cutting their NBA teeth. While they didn’t have quite the impact of their higher-profile draft brethren, this trio’s transition to the pro game was impressive in its own right. Despite a slow start to his NBA career, Isaiah “J.R.” (always my preference) Rider was arguably the best of the rest. In his first 15 games as a pro, he averaged just nine points per game, on 40% from the field. Eight times he failed to connect on at least 40% of his shots, and only twice managed 15+ points. Then, on December 8, 1993, in his second-ever NBA start, Rider confirmed that he was, in fact, who we thought he was, hitting 12 of his 18 shots and hanging 30 on the Portland Trailblazers. Well, he’d actually already confirmed this at his first NBA practice, to which he was unable to arrive in a timely manner- though this foreshadowing only became evident with the benefit of hindsight. Anyway, starting with that early December date with the Blazers, Rider emerged as perhaps the best pure scorer of the class of ‘93. In his final 64 games as a rookie, he averaged 18.4 points and shot better than 47% from the field. During that stretch, he scored 20+ points 31 times, hitting for 30+ on three occasions and 28 on four others. He finished the season on an absolute tear, scoring 25+ in five of his last seven games (the other two were 17 and 22-pointers), including a 12-for-20, 28-point love letter on 4/20 to, well… y’know. With averages of 16.6 points (on 46.8% FG) and 4 rebounds per game, J.R. was the recipient of a well-deserved First Team All-Rookie nod. Before becoming a fixture on the All-Defendant Team (Again J.R.? Seriously? ), Isaiah Rider was on one of the NBA’s most gifted young scorers and rising stars, seemingly destined to light up NBA scoreboards for at least the next decade. Meanwhile, 942 miles due south, the Dallas Mavericks, winners of just 33 games over the past two seasons and in desperate need of NBA-caliber talent, used a second consecutive fourth overall pick on a versatile, potentially elite perimeter scorer. Pairing Mash with a blue chip two-guard in Jim Jackson, the Mavs looked to be assembling an elite young core along the lines of the Harper-Aguirre-Blackman-Perkins crew of the 1980s that came within a single victory of reaching the 1988 Finals. Individually, Mashburn and Jackson delivered the goods, appearing in 161 of a possible 164 regular season games, averaging 19.2 points apiece and combining for 9.2 rebounds and 8 assists per game. Mashburn’s scoring prowess undoubtedly went a long (perhaps the entire) way toward securing his spot on the All Rookie First Team. His scoring average was the highest among rookies in 1992-93, and no rookie had more games with 20+ (37) or 30+ points (7). While his 40% field goal percentage, 26.6% Usage Rate and 13.5% Turnover Rate are (in hindsight) indicative of a complete lack of offensive efficiency, Mashburn clearly belonged in basketball’s top flight. His talent and potential as an offensive force in the NBA were beyond question- it was abundantly clear that Mashburn would soon rank among the NBA’s best at that end. On top of all that, Mashburn was a major catalyst in an 18% year-over-year increase in wins in Big D. Sure, this “leap” only took the Mavs from 11 wins in 1992-93 to 13 in 1993-94, but it’s something, right? Right?? Finally, in Philly, Shawn Bradley, the man selected after Webber and before Hardaway, was putting together a rookie season that, in hindsight, thematically mirrored his entire career- disappointing given the lofty expectations that accompany top-two status, but more effective than history is likely to remember. Bradley was the great oddity of the 1993 draft. Proponents argued that his exceptional coordination and athleticism for man standing 7-foot-6 would set him apart as a pro. Meanwhile, serious questions lingered about not only his strength- no one that tall should weigh just 235 pounds- but also his experience (just one season of college ball) and, on the heels of a two-year Mormon mission and, given his interests beyond the game of basketball, namely to his religion and to philanthropy, his commitment to the game. To address these concerns, the Sixers acquired legendary big man Moses Malone (now 38 years-old and in the final days of his NBA career) to serve as Bradley’s mentor, and hired strength and conditioning guru Pat Croce and a dietitian to help Bradley with his conditioning and to beef up his slight frame in preparation for the rigors of the NBA game. Injury (another recurring theme, though also a bit overstated), specifically a dislocated kneecap suffered in February, limited Bradley to 49 games in 1993-94, but the time he did have on the floor, while far from great (~41% FG, 20.8% Turnover Rate) was well spent on the defensive end. His first game as a pro, at home against the Washington Bullets, is a perfect illustration. In 29 minutes on the floor, he connected on just two of 12 shots and grabbed a pedestrian 5 rebounds, but left an indelible mark on the 12-point win with an incredible eight blocked shots. Despite missing 33 games, Bradley amassed 147 blocked shots (good for 10th in the league) and a 6.4% Block Rate, which was topped only by Dikembe Mutombo’s 7.4% mark. Bradley finished his truncated rookie season with averages of 10.3 points, 6.2 rebounds and three blocked shots (fifth in the league) per game (13.1- 8- 3.8 per 36 minutes), good enough to earn him a Second Team All-Rookie nod. One year in, and so far, so good. As we’d suspected on draft night, Penny and C-Webb were legitimate difference makers, Mash and J.R. could really fill it up, and Shawn Bradley would take a bit of work. With that said, however, it’s difficult to argue that any of these guys was far behind his expected development curve. Even Bradley, whose season was unfortunately cut short, while a ways away from reaching his potential, he demonstrated an elite skill that could keep him gainfully employed in the league for years to come. This is the second in a four-part series examining at the careers and legacies of the top five selections in the 1993 NBA Draft. We’ve looked back at pre-draft storylines and the events of Draft Night, and have now done the same with the rookie seasons put together by the class of the Class of ’93. In the coming installments, we’ll look at the remainder of their respective journeys. We’ll first examine each man’s ascent from All-Rookie to his professional high water mark, before examining the unfortunate events that conspired to cast a disappointing shadow on the Class of ’93. Another great post in the '93 series. I'd forgotten that Skiles started the first half of the season for Orlando. And JR, the dunks. Man. Good stuff.